The bathroom can be a dangerous place during the middle of the night, especially if you’re still half asleep. 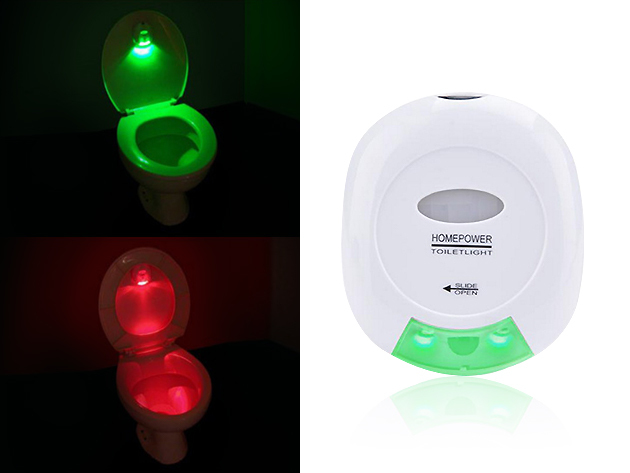 Make sure that you never trip or fall again while walking to the toilet with the Motion-Activated LED Toilet Light. This simple device will make navigating your bathroom at night just so much easier. When you’re in a hurry to use the restroom, the Motion-Activated LED Toilet Light will be your beacon of hope. All you have to do is attach the device to your toilet lid using the adhesive tape. Be sure to stick in 2 AA batteries beforehand, and you’ll be ready to go! Anytime somebody enters the bathroom, the Motion-Activated LED Toilet Light will automatically light up thanks to the motion sensors. It’ll stay lit for an additional 30 seconds after the motion ceases so that you’ll have ample time for your business. What’s especially awesome about the Motion-Activated LED Toilet Light is the toilet seat status. The light turns green when the seat is down and red when the seat is up. The Motion-Activated LED Toilet Light is exactly what you need to make the bathroom a safer place. At 40% off, this useful light will only cost you $11.99!